A team of astronomers has conducted infrared observations of luminous, gas-rich, merging galaxies with the Subaru Telescope to study active, mass-accreting supermassive black holes (SMBHs). They found that at least one SMBH almost always becomes active and luminous by accreting a large amount of material (Figure 1). However, only a small fraction of the observed merging galaxies show multiple, active SMBHs. These results suggest that local physical conditions near SMBHs rather than general properties of galaxies primarily determine the activation of SMBHs. In this Universe, dark matter has a much higher mass than luminous matter, and it dominates the formation of galaxies and their large-scale structures. The widely accepted, cold-dark-matter based galaxy formation scenario posits that collisions and mergers of small gas-rich galaxies result in the formation of massive galaxies seen in the current Universe. Recent observations show that SMBHs with more than one-million solar masses ubiquitously exist in the center of galaxies. The merger of gas-rich galaxies with SMBHs in their centers not only causes active star formation but also stimulates mass accretion onto the existing SMBHs. 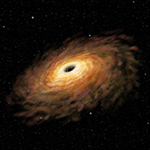 When material accretes onto a supermassive black hole (SMBH), the accretion disk surrounding the black hole becomes very hot from the release of gravitational energy, and it becomes very luminous. By combining the power of Hubble with infrared space-based telescopes and ground-based telescopes, astronomers have now solved a decade-long mystery as to how compact elliptical-shaped galaxies existed when the universe was so young. These “red and dead” galaxies have now been linked directly to an earlier population of dusty starburst galaxies. These objects voraciously used up available gas for star formation very quickly. Then they grew slowly through merging as the star formation in them was quenched, and they eventually became giant elliptical galaxies. Studies of weather on a distant world – where it rains molten iron – could aid our understanding other solar systems. Edinburgh researchers have helped map the surface of a brown dwarf – an object larger than a planet and smaller than a star – for the first time. Scientists say the methods used in their study could eventually be applied to examine small, cool planets in other solar systems. To get an idea of how the early solar system may have formed, scientists often look to asteroids. These relics of rock and dust represent what today’s planets may have been before they differentiated into bodies of core, mantle, and crust. In the 1980s, scientists’ view of the solar system’s asteroids was essentially static: Asteroids that formed near the sun remained near the sun; those that formed farther out stayed on the outskirts. But in the last decade, astronomers have detected asteroids with compositions unexpected for their locations in space: Those that looked like they formed in warmer environments were found further out in the solar system, and vice versa. Scientists considered these objects to be anomalous “rogue” asteroids. But now, a new map developed by researchers from MIT and the Paris Observatory charts the size, composition, and location of more than 100,000 asteroids throughout the solar system, and shows that rogue asteroids are actually more common than previously thought. Particularly in the solar system’s main asteroid belt — between Mars and Jupiter — the researchers found a compositionally diverse mix of asteroids. Using the National Science Foundation’s Robert C. Byrd Green Bank Telescope (GBT), astronomer D.J. Pisano from West Virginia University has discovered what could be a never-before-seen river of hydrogen flowing through space. This very faint, very tenuous filament of gas is streaming into the nearby galaxy NGC 6946 and may help explain how certain spiral galaxies keep up their steady pace of star formation. Spiral galaxies, like our own Milky Way, typically maintain a rather tranquil but steady pace of star formation. Others, like NGC 6946, which is located approximately 22 million light-years from Earth on the border of the constellations Cepheus and Cygnus, are much more active, though less-so than more extreme starburst galaxies. This raises the question of what is fueling the sustained star formation in this and similar spiral galaxies. To make the most of the event, astronomers have planned observations with the NASA/ESA Hubble Space Telescope and NASA’s Chandra X-ray Observatory, Nuclear Spectroscopic Telescope Array (NuSTAR), Fermi Gamma-ray Space Telescope, and Swift missions. As befits its moniker, Swift was the first to take a look. On Jan. 22, just a day after the explosion was discovered, Swift’s Ultraviolet/Optical Telescope (UVOT) captured the supernova and its host galaxy. Remarkably, SN 2014J can be seen on images taken up to a week before anyone noticed its presence. It was only when Steve Fossey and his students at the University of London Observatory imaged the galaxy during a brief workshop that the supernova came to light. NASA’s James Webb Space Telescope has passed its first significant mission milestone for 2014 — a Spacecraft Critical Design Review (SCDR) that examined the telescope’s power, communications and pointing control systems. During the SCDR, the details, designs, construction and testing plans, and the spacecraft’s operating procedures were subjected to rigorous review by an independent panel of experts. The week-long review involved extensive discussions on all aspects of the spacecraft to ensure the plans to finish construction would result in a vehicle that enables the powerful telescope and science instruments to deliver their unique and invaluable views of the universe.